This weekend’s new releases are a study in contrasts–this year’s two best movies–“21” and “Flawless”–and one of its worst, “Stop-Loss.” Due to a movie-screening conflict, I was unable to review, “Run, Fat Boy, Run” (will try to see and review it later). “Superhero Movie” was not screened for critics, a sign that it’s probably a dud. 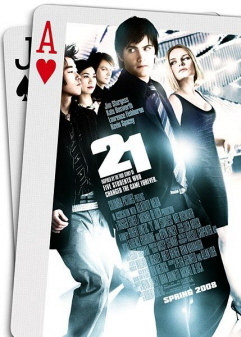 * “21“: Whether or not you like–or approve–of gambling, you will like this movie. It has a moral message. And, regardless, it’s a fun, entertaining, non-political adventure. It’s getting panned by most critics, but I loved it–one of the year’s two best, so far. Based on the novel, “Bringing Down the House,” about Jeff Ma and some fellow M.I.T. students, it’s the story of how the students count cards at the blackjack tables at Vegas casinos. While Ma says that card-counting only increases your chances at winning in blackjack by 3%, that 3% makes a big difference. In the movie, we watch students organized by their cunning professor (Kevin Spacey) making hundreds of thousands of dollars a pop. But it comes with a price. In the movie, there is no Jeff Ma. Instead, Jim Sturgess, a British actor, plays a working-class MIT student who can’t figure out a way to pay for Harvard Medical School. After he’s discovered to be a whiz at numbers Spacey and his students, including the beautiful Kate Bosworth, recruit Sturgess. Soon, he blows off his nerdier MIT friends for trips to Vegas and big money, which will pay for med school. But he soon discovers that professor Kevin Spacey is a vindictive, violent creep. Far-leftist Spacey’s real-life love-fest with Venezuela’s nutty dictator, Hugo Chavez, definitely came in handy for the thug he plays. It’s really more of a caper movie than a movie about gambling. I enjoyed it a lot. * “Flawless“: This is another caper movie and also one of the year’s two best, so far. 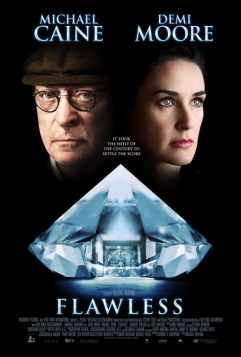 It takes place in 1960’s London, where Demi Moore plays a bright American executive at “Lon Di,” the London Diamond Corporation–Europe’s largest diamond broker. The only woman executive in a world of males, she is passed over for promotion after promotion, even though she is more qualified. Soon, she learns from the building’s janitor, Michael Caine, that she will be fired. Moreover, the company has poisoned the well against her, as she tries to look for another job in the finance world. But, she hasn’t been fired yet. She goes along with Caine’s plan to rob diamonds from Lon Di. This movie was fun, exciting, nail-biting, and escapist. And it was charming. The acting was so good, you forget that it’s Demi Moore in the lead role. She even gets right the fake semi-English accent that American expatriates to England sometimes engage in (Madonna, originally from the Detroit area, comes to mind). And the clothing, building architecture, and design are perfect to the period–the ’60s. The set designers and wardrobe people did their job, here. While the ending is a little too neat and somewhat cheesy and some occurrences challenge credulity, I highly recommend it, as the rest was pure gold. Mrs. Ashton Kutcher is back. And now she’s graduated to great acting in great movies. 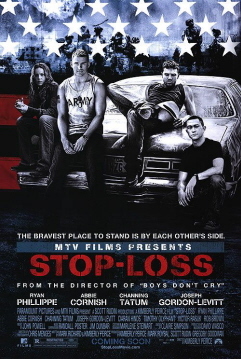 * “Stop-Loss“: This movie is exactly what I predicted–on this site–that it would be. Produced by MTV Films (and that’s “’nuff said” right there), it’s a movie against the war in Iraq, against our military, and against its policies. And worse than that, it’s a movie that portrays middle-American soldiers–in this case from Texas–as complete hicks from jingoistic, uncultured families, with nothing going on. The ex-Mr. Reese Witherspoon a/k/a Ryan Phillippe must’ve figured that since his ex did an anti-war bomb in “Rendition,” that it was his turn to produce the same with “Stop-Loss.” And that he did. This movie is as boring as “Rendition,” maybe more so. It was so slow, I kept wanting to go to sleep. But I perked up when it showed us the “hick” soldiers shooting bottles in the woods and then catching a rattlesnake, which we saw skinned alive and cooked in a stew of tomatoes for dinner. And we hear a whole lot of non-stop whining and watch a whole lot of Phllippe and his Texas soldier buddies engaging in violence, drunkenness, relationship dysfunction, crying, flashbacks, and–ultimately–suicide. Sgt. Phillippe (of Delaware, in real life), with his bad Texas accent (everyone in this flick has a bad Texas accent, so deep and exaggerated it’s like an SNL skit), finds out–after returning from a hellish terrorist attack in which he lost several of his men–that he’s been “stop-lossed,” that the day he’s scheduled for an honorable discharge from the Army, he’s been ordered to serve another tour of duty back to Iraq several days later. Phillippe encounters dead ends and obstacles. And *****SPOILER ALERT*****, he ultimately returns and goes back to Iraq. The end. You’re always saying that this war is so snakebit, that they won’t let us fight it the way we need to win it. We ought to throw a bomb on a city there, every time there’s a terrorist attack against us. And at the beginning of the movie, we watch the soldiers go door-to-door/apartment-to-apartment, looking for terrorists, who kill them one by one. This is never how we will win or how we will show the terrorists we mean business. I agree that we’re not fighting it the way we need to win it. We are being too nice, too humanitarian. And it will be the death of us, if not there then in the future elsewhere. Had we fought it in a tough manner and dropped bombs, we’d be outta there by now and there would be no need for stop-losses. That ought to be a movie. Not this lackluster, whining screed. Other than those brief moments of truth–which are not at all the point of the movie–this film is a boring, depressing, complete waste of time. Rated “P” for Propaganda. Skip at all cost. Please make a presentation concerning FITNA. I have seen it yesterday and this is a terrifying movie. My whole family could not sleep after this, though we know all this pretty well, but collected together it is terrifying. The life of a man, who has done it, is in greatest danger, and he must enjoy as the least our open support. The Iraq war has gone on long enough. Bring the troops home. considering I have read online at least 5 or 6 stories of sodliers and Marines returning after losing legs and other soldiers returing after being hurt in other ways, this makes this movie seem so unbelieveable so I will try to avoid it. considering I have read online at least 5 or 6 stories of soldiers and Marines returning after losing legs and other soldiers returing after being hurt in other ways, this makes this movie seem so unbelieveable so I will try to avoid it. Hi Debbie, I just wanted to say thanks for all the hard work that goes into your blog. Your piece on Hannity was eye opening. Keep up the good work. Sanantonioins, as soon as we’ve “neutralized” immanutjob and the mollusks. Drudge is reporting that Stop-Loss is “DOA.” Yet another anti-Bush, anti-Iraq, anti-military film that bombed. Pun intended. Americans may be tired of the war, but clearly they are even more tired of al-Hollywood’s jihadist attacks on the military. I liked 21. I took my girlfriend to see it last Friday night. Too bad about “Stop-Loss”. I had been thinking about seeing it. I thought maybe it was the true story about a soldier fighting his stop-loss. It was a big court case a few years ago, but I don’t remember much about it. I don’t even know if the guy won or not. As a vet, I firmly believe you should do your duty. Joining is all about self-sacrifice. Since we are an all-volunteer service, whiners can go to, well, you know where. The reverse of her role in Disclosure? Oops. What I meant was, does she take on the Michael Douglas role in Disclosure?